The research was funded in part by a Fulbright Scholars Grant and Webster Faculty Research Grant. Earlier this semester, DJ Kaiser, associate professor and Coordinator of Teaching English as a Second Language, presented at two different conferences on his research in South America, which were supported by a Fulbright U.S. Scholars Grant and a Webster University Faculty Research Grant. The first of these conferences was “Close Encounters of the Remote Kind in the Creation of an Educational Community” in Montevideo, Uruguay. Kaiser was invited to deliver the closing keynote for this conference by the coordinators of the project he researched in Uruguay. 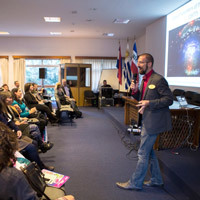 In his keynote, entitled “Ceibal en Inglés: An Alien Look at Today’s Future,” Kaiser presented some preliminary data from surveys of Uruguayan public school teachers conducted as part of a case study. Ceibal en Inglés provides English instruction through a combination of face-to-face instruction and lessons delivered via videoconference. More than 3000 lessons a week are delivered to public school classrooms from fourth grade through high school with remote teachers in Uruguay, Argentina, the UK, the USA, and the Philippines. 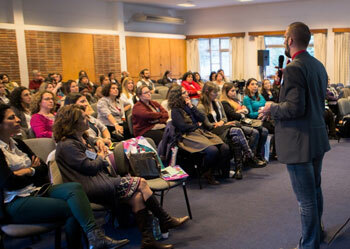 Earlier this year Kaiser spent time in five different cities throughout Uruguay to observe classes and conduct interviews. throughout Uruguay to observe classes and conduct interviews. In this presentation he combined his Fulbright research in Uruguay with that of his Faculty Research Grant project in Rio de Janeiro on EnglishWorks, which provides free English courses in disenfranchised neighborhoods. Classes are supplemented with videoconference portions to provide access to English speakers that may not be found in these neighborhoods. Kaiser spent more than three weeks in Rio de Janeiro working closely with the EnglishWorks team and teachers. MIDTESOL is an affiliate of TESOL International, of which Kaiser is a member and volunteers on the Standards Professional Council. Earlier this year, he presented on his research at three other TESOL affiliate conferences: AMTESOL in Orange Beach, Alabama; TESOL Arabia in Dubai, United Arab Emirates; and BRAZ-TESOL in Brasilia, Brazil. Hear more about the research in this interview with Rick Rockwell, Webster University’s chief communication officer, for Latin Pulse. Rockwell focused questions on Kaiser’s research in Uruguay and Brazil, but the interview also touched on his travels in Argentina, Paraguay and Peru. Earlier this month, Kaiser delivered a webinar for Brazil’s Languages without Borders (http://isf.mec.gov.br) created by the Ministry of Education, which serves Science without Borders (http://www.cienciasemfronteiras.gov.br/web/csf-eng/faq). His webinar focused on skills for teaching English pronunciation for English teachers and teacher trainers in Brazil working with STEM specialists that need English to share their research. The webinar will be archived for other teachers and teacher trainers to access. For more on Kaiser’s research in South America, see the School of Education’s blog, Transformational Teaching, at http://blogs.webster.edu/education/2016/11/07/1712/ with a recent article by Teaching English as a Second Language graduate student, Jim Fuller.